The End of the Utopia , an exhibition that brings together two artists from the highly geometric figure: Emil Lukas and Jacob Hashimoto . The very linear layout succeeds in creating a dialogue between the contemporary sign with stucco building Flangin the Campo San Geremia. But the works of Beverly Barkat for the exhibition Evocative Surfaces was inspired by the halls of Palazzo Grimani , one of the few Renaissance palaces, which displays his work. Jacob Hashimoto and Emil Lukas, two internationally recognized American artists, have been invited by Studio la Città Gallery to stage a site-specific show in Palazzo Flangini reflecting on “The End of Utopia”. As we move deeper into the Anthropocene, the cost of our ascendancy is becoming clear. Decades of environmental exploitation have left us perilously balanced and wavering on every side: political, social, economic, natural, technological, and ecological. As many observers of the Anthropocene have noted with apt unease, humanity itself has increasingly become the perpetrator, rather than victim, of planetary chaos. Emil Lukas’s work occupies the first-floor of the space. Lukas has created three separate, but interwoven, groups of work: “Lens,” “Puddles,” and “Threads.” At one end of the vast gallery, 650 aluminum pipes are assembled into a giant lens of sorts. Through its side-by-side tubes, the concave, almost iridescent sculpture affords a vista that moves with the viewer according to his or her position. From the right angle, the lens focuses and isolates the viewer, distilling the experience of the artwork to a single, fundamental perspective—the watchman’s post in the Panopticon. While Lens speaks to the seductive nature of observation and surveillance, the Puddle paintings are vast microcosmic landscapes that, conversely, conjure an unobserved, almost geologic progression of time. More like sculpture than painting in many ways, these works feature surfaces pulled into funnel-like concavities by clusters of taut thread. Lukas then allows masses of paint to collect in these depressions, letting the pigments separate, reticulate, and form stratifications. As the paintings dry, the pigments leach through each canvas, staining and revealing the surfaces’ buried histories. "For Emil Lukas latest eponymous exhibition, the Pittsburgh-born artist brings his layered pieces of thread and larvae paintings to Sperone Westwater Gallery in New York City." To see the full article of Michael Lieberman's review. Please follow the link below. Take a look at the most recent sculptures as laid out in Emil's studio in Stockertown, PA.
ArtNet News - "Emil Lukas’s Abstract Larvae Paintings Are Physical Feats of Creation"
For Emil Lukas, this may not be unwelcome news. A sculptor and process painter who once divided his time between a Harlem studio and one in Stockertown, Pennsylvania, he now maintains two studios in the Keystone State, and in one of these he creates what he calls Larvae paintings. The paintings are not representations of larvae, as you might think. In this case, the actual fly larvae of, say, Calliphora vomitoria, the blue bottle fly, behave as tools of his trade. They are what Lukas uses instead of conventional paintbrushes (not exactly Yves Klein’s “living brushes,” but hey). It is February 22nd when I meet the artist at his downtown gallery, Sperone Westwater, on a bright Saturday morning. The Bowery neighborhood is on the march—to yoga, the nail salon, the Apple store, Falai. But in here, in this space, there is a slow heartbeat, thankfully. This is the final day of Lukas’s solo exhibition, which opened on January 9th. On some walls hang his Thread paintings—works with colored polyester thread (physical, structural, pictorial lines) pulled over painted wood frames and “locked down” (as he puts it) on the edges. On other walls hang the Larvae paintings. It is these that hold my attention. Lukas and I discuss the role that the weather plays. Consistently hot weather is essential to the work; it’s what motivates—literally—the insects during their residency at his Stockertown studio. The temperature determines the speed of what Lukas refers to as his two-month production season. During the doggy days—usually August and September—when the weather is the hottest, the larval life cycle is the most rapid. Months before the larvae arrive, however, Lukas is hard at work, alone, during dark afternoons. Round about mid-February, he begins fashioning wood panels and stretching canvases. Then he adds many layers of gesso, applied and sanded many times, to approximate a surface as smooth as paper. Come May (and crocuses), he’s applying acrylic paint and introducing color and composition. During these early days, Lukas estimates that he applies between 30 and 50 layers of paint using everything from rollers and all manner of fibrous brushes to splashing to spraying. He tints the primers, puts in lines or circles—to produce a set of compositionally unique “underpaintings.” One might be warm, another cool, another congested, another light. “I want the paintings to stand in relationship—I want the paintings to stand apart from one another as early as possible, before the larvae,” he explains. Interior view of Emil Lukas’s studio barn. Photo: Zach Hartzel, courtesy the artist and Sperone Westwater, New York. How Lukas lures his blind collaborators is his own private, ugly secret about what he terms “the science” of the process. He won’t discuss that part. But come on, I say. Why flies? “What I’m trying to achieve I feel can only be achieved this way, and it’s something that I’ve worked for 20 years to develop,” the artist states. Twenty years? Actually, a few more than that. One night during the late 1980s at his Harlem studio, Lukas casually murdered a pesky fly and left it overnight in a four-inch puddle of paint on a piece of cotton paper. The following day, much to his surprise, he returned to a drawing suggestive of a pattern of electricity or lightning. It turns out that his victim had been a life-bearing fly, carrying larvae, and the tiny life forms had tracked paint all over the paper. Lukas was intrigued and began to conduct research and experiments with many organic materials, such as mold, seed germination, spore drops, carbon, and fat. Only flies (he has not worked with other insects) achieved the status of full-blown obsession and then: art. Of course, Lukas sets countless parameters of play—including lighting (natural, artificial, direct, diffused—the larval visual system reacts to all of these), vibration level (the paintings are on wheels), density of color (Lukas uses a mixture of ink and paint, both water soluble), and the level of wetness of the canvas itself. I suppose I must love that too. I lean in towards one, then out. It’s wider than I am tall. A wiggly line reminds me of a river seen from 35,000 feet in the air. Hm. Now I inspect a coil. Could a human brain produce that design? He and I pause, we human-brained beings, and look at each other. One painting, called Rain, has an underpainting of butty-day white; the foreground is a brambly tangle. “I want people to look at the paintings, and I want them to think about them like calligraphy or like lightning or roots or the history of painting being applied to a canvas in the many ways that other artists have done it,” he says. But none of this occurs to me. Thoughts are not formulating. Instead, I begin to peer into the abundance of tangle. The mind-feel (for lack of a better phrase) of a small child in the woods comes over me. Somewhere beyond that derangement of lines, in the center of the canvas, is a place akin to the Platonic ideal of a clearing. I feel as though I can step into the canvas, away from grownups into a safe place of my own. No flies are here. I look at Lukas. By virtue of his curiosity, sparked all those years ago in Harlem, he has landed me somewhere realer than fiction. It’s possible the expression on my face tells him he has accomplished something unusual. Whitewall Magazine - "MARGARET GARRETT, EMIL LUKAS, AND MELISSA MEYER"
Then there is the truly elegant display of work from the last year by Pennsylvania-based artist Emil Lukas at Sperone Westwater Gallery. Although not widely known in the United States, Lukas has shown his work throughout Germany, France, Switzerland, and Italy, including as part of the renowned Panza Collection in Varese. Lukas “paints” his so-called thread paintings, to which half of the show is devoted, by drawing intricate skeins of various colored polyester threads across his canvases. These thread paintings can read like musical instruments, nearly throbbing with a tympanic tautness. Five of those on view have a glowing circle-within-a-square motif that seems to invert Anish Kapoor’s widely exhibited, seemingly floating, two-dimensional, fiberglass wall sculptures. The luminous orbs in these five works appear to be lit from within. Like James Turrell, Lukas can seem like an illusionist, optimizing light, color and the shifting angle of the viewer to create a unique and elusive optical experience. Unfortunately, as Lukas said when we toured the gallery minutes before the show’s opening, “Historically I make work that is impossible to photograph.” He’s right on this count. No image I’ve seen has been able to capture either the ethereal luminosity or complexity of craftsmanship of the thread paintings. That rings true, because despite the materials, there’s nothing artsy-craftsy about these works. If, like me, you’ve ever admired the artistry of a handmade drum or marveled at the inside of a piano, you will especially like Lukas’ work. TimeOut New York - "Emil Lukas"
A process-oriented artist, Emil Lukas has a history of making abstract, accumulative works out of unusual materials. In Europe his reputation was boosted by one of the world’s leading collectors, the late Count Giuseppe Panza, who acquired 67 of Lukas’s pieces. Now the artist returns to Sperone Westwater with two series created during the past five years: the “Larvae Paintings” and the “Thread Paintings.” In each, he pushes his pursuit of the sublime in ambitiously new directions. The former group consists of luminous, large-scale abstractions that are “painted” by maggots under the artist’s control. He dips the grubs in ink, places them on the canvas, and directs them with lights and tilting motions, creating patterns that no hand could replicate. He then layers the surface with washes of pinks and blues, letting loose the larvae once again to leave ghostly networks of lines. 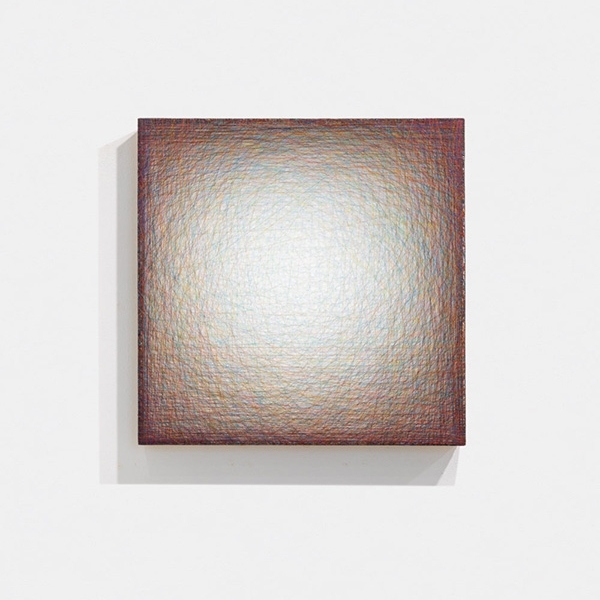 The works in the second series are created by stretching thousands of feet of multicolored thread across wooden frames backed with reflective film. Lukas employs two distinct patterns: webs that radiate from an airy center to a denser perimeter, and vertical spectra that seem to vibrate as your gaze traverses them from end to end. Compelling and energetic, Lukas’s efforts open portals to a realm where line, color and the mind’s eye collide. LC journal - "Emil Lukas at Sperone Westwater NY"
NEW YORK, NY: Thread Paintings and Larvae Paintings. These are the two major bodies of works by Emil Lukas for its latest exhibition at Sperone Westwater in NY. The unique ability of Emil Lukas to harness the physical attributes of materials and organic processes, his distinctive use of everyday organic materials, such as thread, silk, or larvae, and innovative techniques, create intricate works which engage the viewer in an intimate and contemplative way. Colour, opacity and densit create in most of his works a sort of three-dimensional object that enchant the viewer. Born in Pittsburgh, Pennsylvania, in 1964, Emil Lukas has exhibited throughout the United States and abroad, including the solo exhibition “Emil Lukas: Connection to the Curious” at The Aldrich Contemporary Art Museum in Ridgefield, CT, in 2005. His work is in important private and public collections, such as the Panza Collection, Italy; The Dakis Joannou Collection, Greece; and the Crystal Bridges Museum of American Art, Bentonville, Arkansas. Who might have thought spools of thread in every Pantone shade and trails of ink-covered crawling larvae would be the foundations of a painters work? Those are the media at the core of new inspirational body of work from Emil Lukas. For his latest eponymous exhibition, the Pittsburgh-born artist brings his layered pieces of thread and larvae paintings to Sperone Westwater Gallery in New York City. Lukas lives and works in Stockertown, Pennsylvania, where he converted a 19th-century barn into a studio where he weaves his distinctive thread paintings. He creates his stratified pieces in a silent dance: Lukas loops a line of thread on nails affixed on the sides of a shallow box, stretches it across the face, and waltzes to the opposite border where he takes a moment to observe the composition before locking it down. He continues the technique with other strands of thread in multiple shades and he calls the result a “painting”. They are dense on the edges and seem to emit an ethereal glow from a distance. However, the individual lengths of raw material and color reveal themselves as one draws closer to to the work. While Lukas’ thread paintings suspend in a box of optical-illusion color, his larvae paintings are grounded in complex layers of monotone. A few hundred yards away from Lukas’ studio was an old Massey Fergusen Tractor dealership factory, which he bought a year ago and turned it into his experimental space for his larvae works. In the summer, Lukas breeds fly larvae eggs in the space and begins working on multiple paintings at one time. He introduces mature larvae onto a primed canvas and deposits ink next to them. He maneuvers their movement by casting light and shadows while they crawl, dragging the ink across the surface, creating dynamic squiggly lines. He applies a milky wash over the larvae-drawn canvas and repeats the process. Lukas doesn’t keep count of how many larvae or layers he goes through to finish the paintings. But rather, he goes for a “look” or pictorial atmosphere he wants to achieve, often based on the title or relationship it has with paintings next to it. The exhibition at Sperone Westwater runs through February 22. Art in Print - "Emil Lukas: Bubble-Up"
Arteidolia - "Curating my Refrigerator"
“Ream” means a ream of paper. “Veg.” is short for “vegetables.”) At Sperone Westwater, Lukas’ work was impressive, accomplished, but rather empty. On my refrigerator, the piece is consoling. Maybe it’s the miles of white snow around us, but red thread cradling a bluish sphere seems mystically meaningful. Within each of us is a delicate sphere we must protect. ModernPainters Magazine - Feb. 2014 - "New Threads"